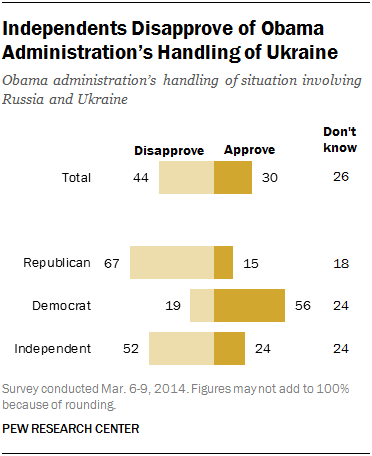 The new national survey by the Pew Research Center, conducted March 6-9, 2014 among 1,003 adults, finds more disapprove (44%) than approve (30%) of the way the Obama administration is handling the situation involving Russia and Ukraine, while roughly a quarter (26%) offer no opinion. 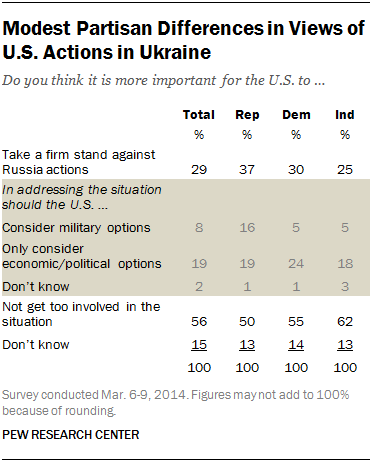 But partisans generally agree that the U.S. shouldn’t get too involved in the situation. 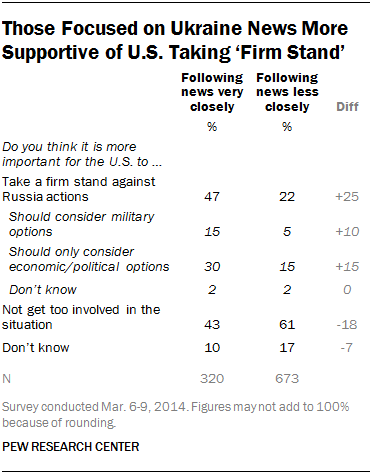 Half of Republicans (50%) say it is more important for the United States not to get too involved; just 37% think the U.S. should take a firm stand against Russian actions. Among Democrats, 55% prefer not getting too involved and three-in-ten (30%) say the U.S. should take a firm stand. Those who say it is more important for the U.S. taking a firm stand against Russian actions in Ukraine were asked if the U.S. should consider military options or only political and economic options. Most of this group – 19% of the public overall – said the U.S. should consider only political and economic options in addressing the situation, while just 8% of the public think that military options should be considered. Just 16% of Republicans and smaller shares of Democrats and independents (5% each) say that military options should be considered. There is broad agreement that Russia was not justified in sending troops into Ukraine. Overall, 68% say Russia was not justified in sending troops into Ukraine while just 10% say it was justified; 22% express no opinion. There are no significant partisan differences in these opinions. Among the public, 28% say they are very closely following news about Russia sending troops to Crimea in response to a new Ukrainian government, while 31% say they are following news about Russia and Ukraine fairly closely; 40% of the public is following this story not too closely or not at all closely. By comparison, the early stage of the conflict between Russian and Georgian forces in August 2008 drew lower interest; shortly after the conflict began, 17% tracked news about the situation very closely. Interest rose the following week (to 35% following very closely) and then declined. By the end of August 2008, as news coverage of the situation decreased, 22% said they were paying very close attention to the Russia-Georgia conflict. Those who are following the news very closely are more inclined than others to advocate for the U.S. to take a firm stand against Russia. Among those closely following the news, roughly as many say the U.S. should take a firm stand (47%) as prefer not getting too involved (43%). But among those paying less attention, a much greater share say it is more important not to get too involved (61%) than to take a firm stand (22%). Among both groups, however, wide majorities say Russia was not justified in sending troops and more disapprove than approve of how Obama has handled the situation. There are no significant differences in the shares of Republicans, Democrats and independents following this story very closely. Overall, about as many followed news about the nation’s economy as the situation in Ukraine very closely (28% Ukraine, 27% economy). Nearly as many closely tracked news about the rollout of the 2010 health care law (23%). By comparison, 19% very closely followed news a week earlier (Feb. 27-Mar. 2) about violence in Ukraine and the new government there. 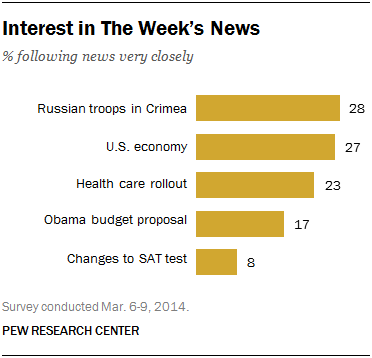 News interest last week about Russian troops in Crimea was highest among those with higher education levels. Roughly four-in-ten (38%) college graduates very closely followed the story, compared with about three-in-ten people (29%) with some college education and two-in-ten (20%) with a high school degree or less.